Are you looking for something new and healthy to add to your kids lunch boxes? If you are I’m sure you will love this fab new healthy yoghurt from The Collective for kids. My kids are fussy and I struggle with what to add to their lunches. Do to the fussy element I like to make sure that they are getting all the essential things they need to be healthy and strong. Oh and to function well at school and learn heaps. If kids don’t have a good breakfast or diet it can affect their education. No one can learn on an an empty belly. The same goes for when you’re at work, if you are hangry you are not your best. No one is safe really until you’ve eaten, same for kids. Not mass produced, the yoghurt is made in Australia with ingredients sourced directly from our local farms. Creamy, certified organic probiotic yoghurt blended with real fruit served in a portable patch with a child-friendly cap. A source of calcium with no added nasties like preservatives ‘n’ stuff! Support recycling in Australia, The Collective have partnered with REDcycle Australia for a green disposal option for used and cleaned Suckiespouches. Freezable, highly compatible with lunchboxes. Vegetarian friendly and gluten free. I was kindly given a voucher to purchase the new range of Lil’ Suckies yoghurts. I purchased two of each flavour, strawberry, banana and blueberry. The twins tried the banana and blueberry and I the blueberry as well. My favourite is the Blueberry. One great thing about the packs that the Lil’ Suckies come in, is that you can put the lid back on them to pop back in the fridge. This is ideal if you’re little one didn’t finish it in one go. You can also add to your kids cereal in the morning too. I love the fact that the yoghurt is all organic and has fresh probiotic for little bellies. 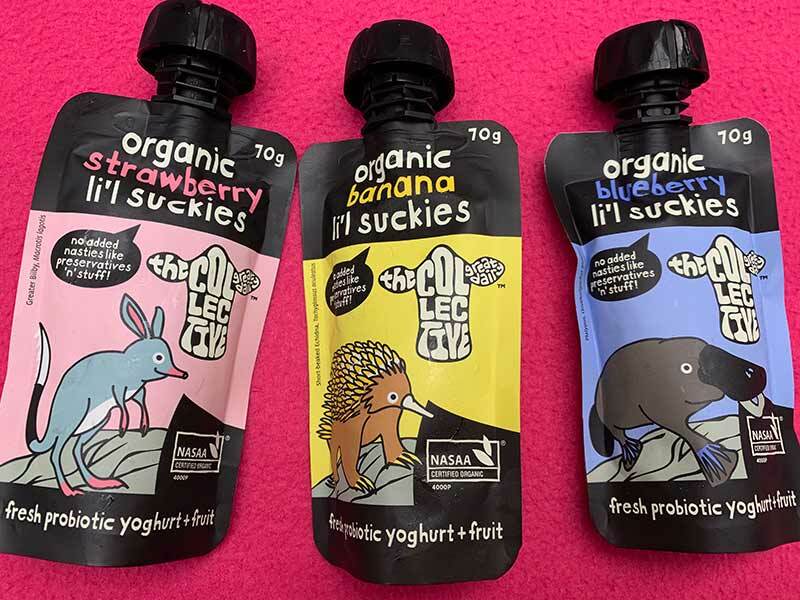 The Collective Organic Lil’ Suckies Yoghurt has fun and such eye catching packaging. 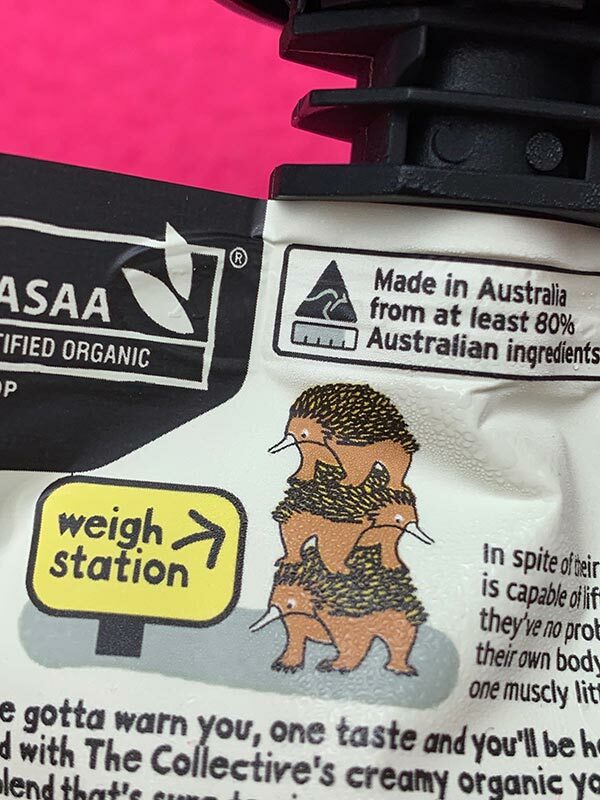 On the front of the packs are Australian animals and on the back is an explanation about the animal. For example, on the banana pack there is Echida and tells you more about how strong they are. Who knew that these animals could lift very heavy things. 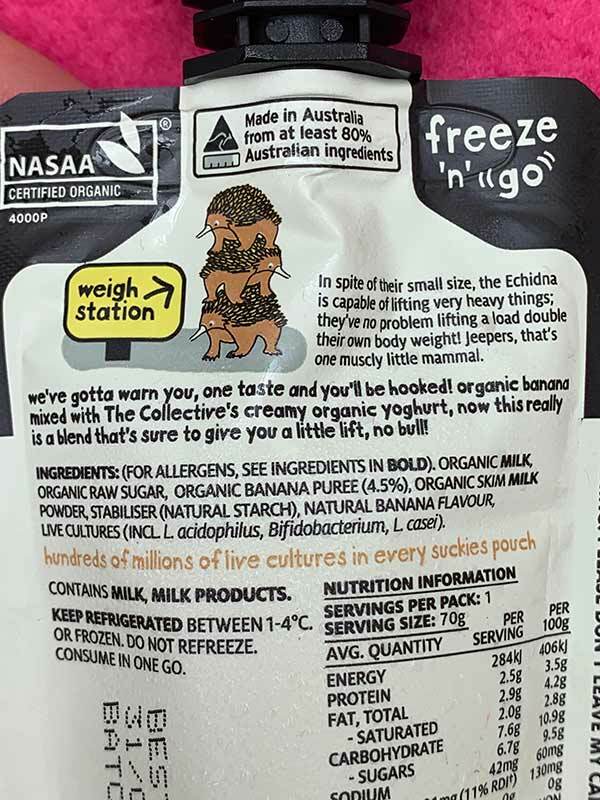 See the back of all the packs below, and how fantastic to have more info for kids to learn more while eating their yoghurt. Banana Lil’ Suckies Organic Yoghurt featuring an Echida. Fun image of super strong Echidas. 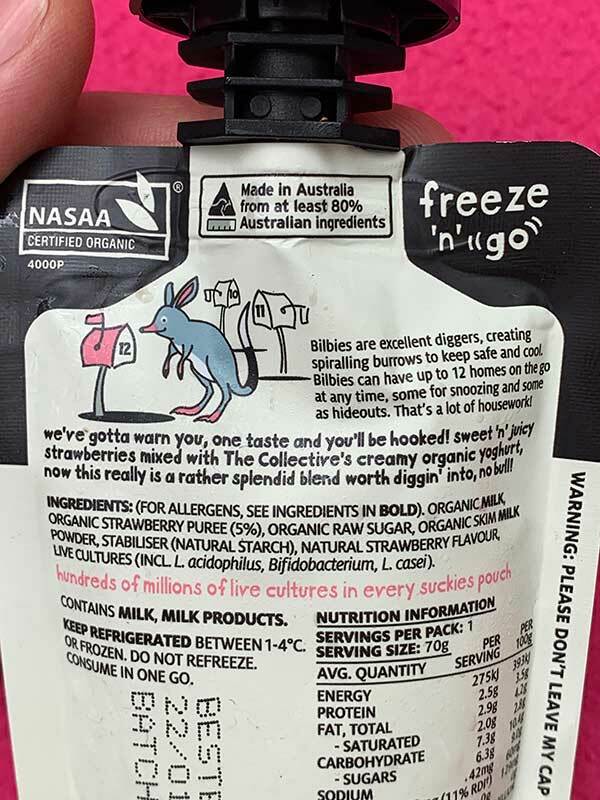 Strawberry Lil’ Suckies Organic Yoghurt featuring a Bilby. Learn more about the Bilby on the back of the pack. 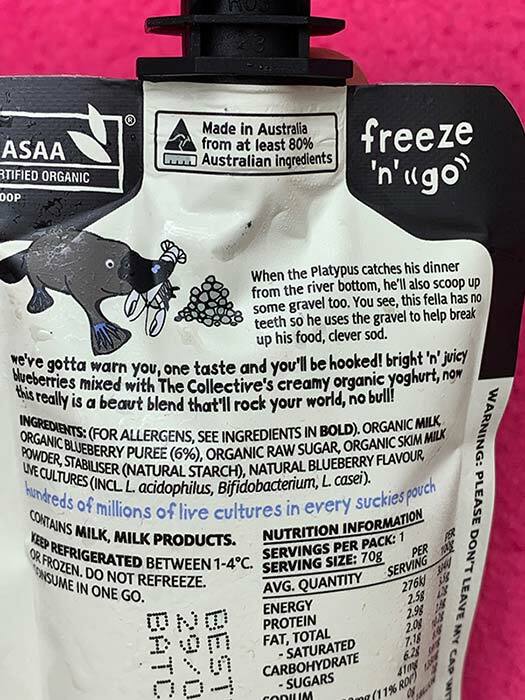 Blueberry Lil’ Suckies Organic Yoghurt feature a Platypus. Learn more about this amazing animal on the back of the pack. Q. “Why would you love to win a $50 voucher to buy The Collective’s Organic Suckies? 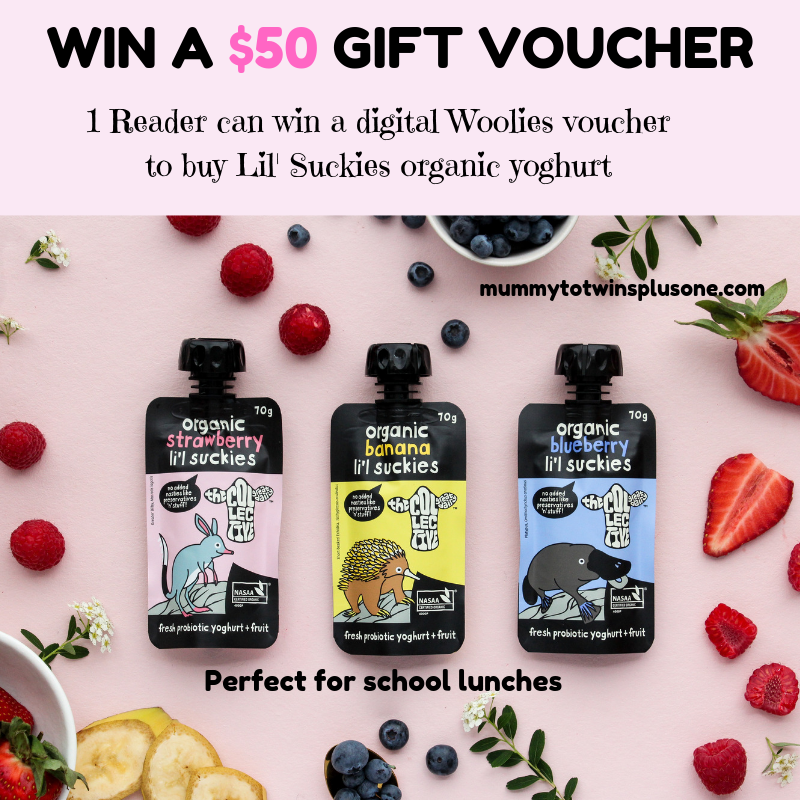 The voucher will be a digital Woolworths voucher so you can go shopping for the Lil’ Suckies yoghurt and get as many as you like. Since it is a digital voucher, please make sure that you enter with an email address that you check often. Midnight 1st of February 2019. A HUGE thank you to The Collective Organic Lil’ Suckies Yoghurt for my voucher and for my reader. The yoghurt is yummy and such a good size for kids. Would be a colourful, taste sensation surprise for my toddlers. It would be an introduction to some more animals for them too. Would also keep them quiet for a little while. Always up for a healthy toddler treat! Perfect for ensuring my little ones are getting enough goodness while they start their first year at kinder and school. On the seach for a tasty yet healthy alternative treat. 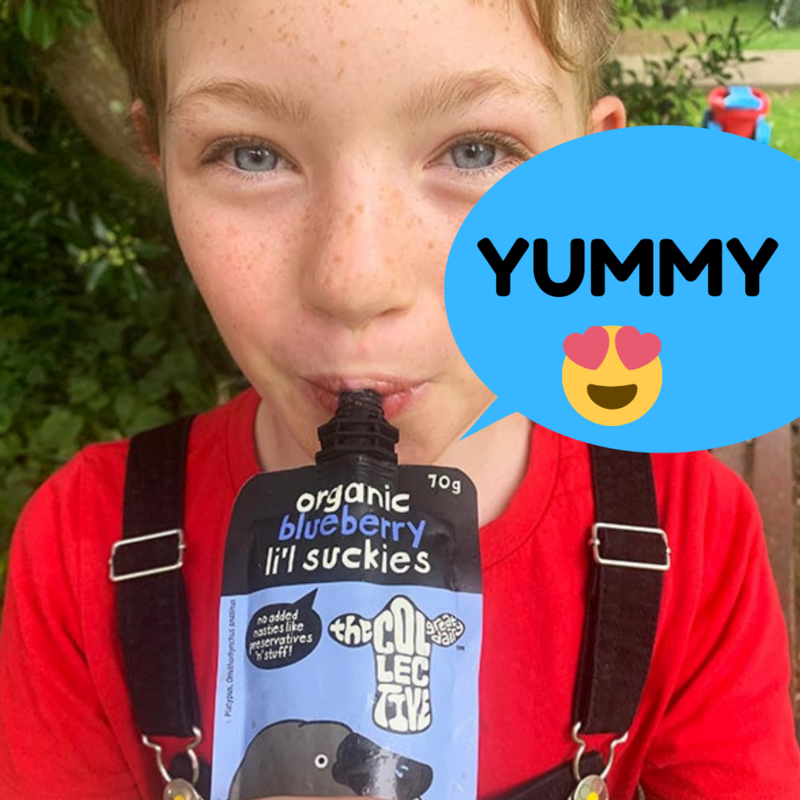 What contains no nasties and is full of goodness, The Collective’s Organic Suckies can’t be beat! To taste natural ingredients and a great source of protein is important. Also, I like the fact that this company supports the Brownlee Foundation. My daughter is addicted to yoghurt and this would make her first day at a new preschool a little sweeter! Going into my 11th year of making lunches, I need all the help I can get with yummy snack ideas! The Collective’s Organic Suckies look fabulous. Great concept. Love to try thank you. To give my little ones their daily calcium intake in a delicious way! 💚 Foods in tubes are fun, especially if you make slurping noise like my kids do. The organic goodness would all get eaten up, which would impress this mum! 💛 The Aussie animals on the packaging is a great conversation starter and a way to learn some amazing facts. I know this knowledge would get broadcasted for show and tell! 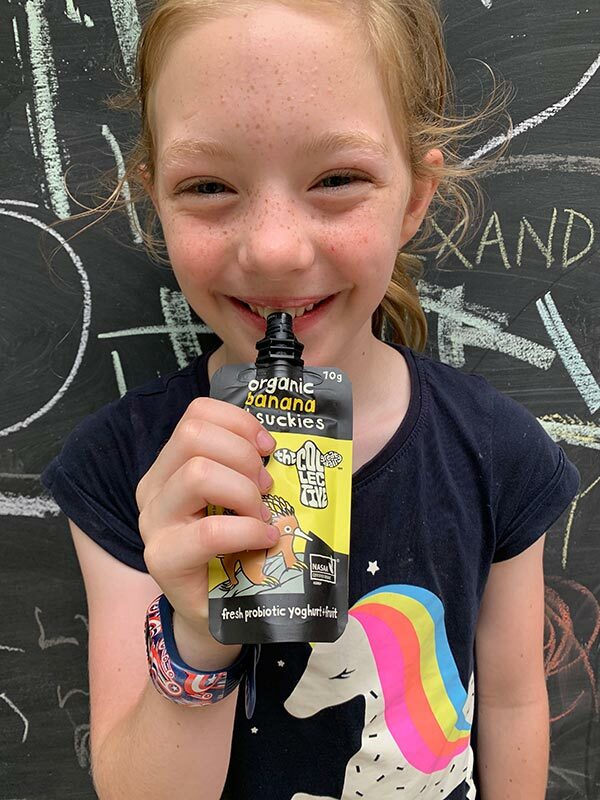 💜 Most of all, I love that The Collective Organic Suckies are healthy bone boosting snacks for at home, school, out and about and as it too often happens… on the run! We’d love to try them. My 5yr old girl spent 4 weeks of school holidays with a case of diarrhea. She had picked up 2!! parasites so it was like a case of double Bali belly. She keeps asking for yogurt but the doc said to eat bananas however my partner thought yogurt would be good for her belly… unfortunately he got a passionfruit one which spiced her up so she says and she wouldn’t eat it. She would love some awesome suckies to get her body back and healthy again. A healthy snack with a little bit learning thrown in for good measure is a snack worth splashing out on! My pre-schooler loves having yogurt for dessert, and I love single serve packages so she’s not “negotiating” for a family-size portion from a bigger container. So often though, it’s a compromise with the amount of sugar and other preservatives they pack in. These look really worth trying with organic raw sugar instead of the processed junk, and real fruit instead of chemical flavouring. Added bonus is being able to use these for my youngest who wants to copy EVERYTHING but never has the tummy space for a portion to equal the big kids. Pop the lid back on and nothing wasted! They sound great and I am sure my kids would love to try them. And yoghurt they never waste! So the teachers won’t go insane.